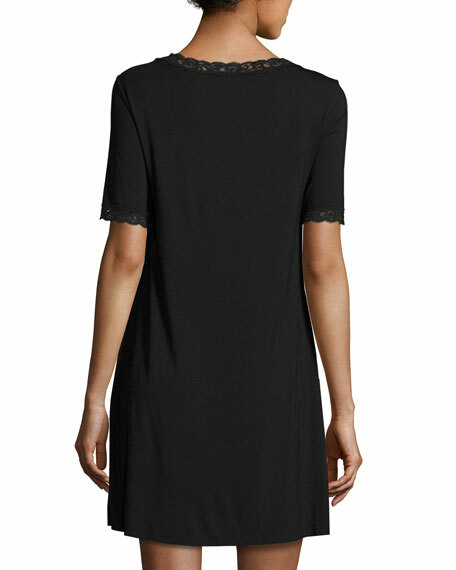 Natori "Feathers" sleepshirt with lace trim. Half sleeves with lace cuffs. Commando sheer technical mesh top. Crew neckline; long sleeves. Fitted silhouette. Straight hem. Nylon/spandex. Made in USA of domestic materials. 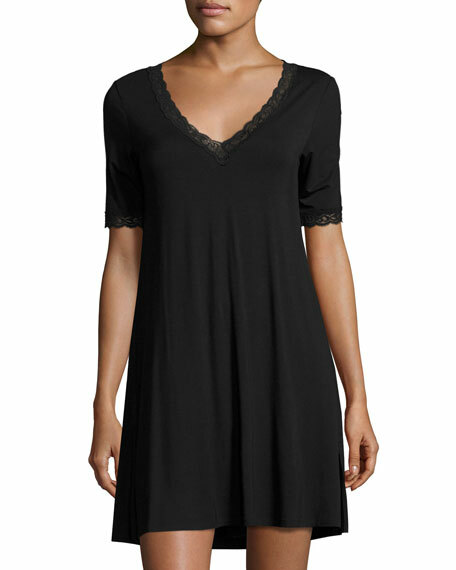 Cosabella "Bella" jersey sleepshirt with contrast piping. Notched collar; mother of pearl button front. 3/4 sleeves. Patch pocket at left chest. Relaxed silhouette. Shirttail hem. Cotton/modal. Imported. Hanro "Ella" seamless knit top with 3D ornamental lace inset. Round neckline. Long sleeves. Styled with flat satin trims and a hemless bottom. Seamless* sides for the perfect fit. Fitted silhouette. Pullover style. Mercerized cotton. Made in Portugal.